UPDATE: To see yesterday's UV-B across the USA, click here and select the closest city from the location list. (To convert readings to UV Index, divide by 0.025.) The Seguin USDA site will have 10 years of data on 24 March 2014. The instruments were calibrated/compared at Hawaii's Mauna Loa Observatory in both 2010 and 2011. The USDA UV-B Monitoring and Research Program is a program of the US Department of Agriculture's Cooperative State Research, Education and Extension Service (CSREES). The program was begun in 1992. It is administered by Colorado State University. The program, which is headed by Dr. Jim Slusser, is designed to provide data about the geographical distribution and temporal trends of UV-B (ultraviolet-B) radiation in the United States. 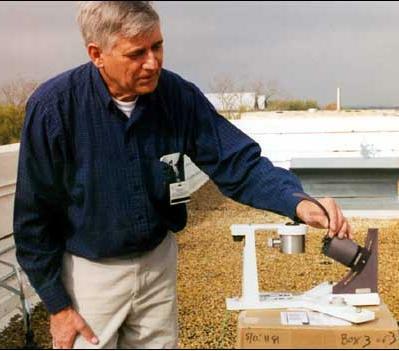 This page concerns the USDA UV-B site that was installed on the roof of the Moody Science Building at Texas Lutheran University (TLU) in March 2004. The site monitors discrete wavelengths of UV-B and visible sunlight by means of two Yankee shadowband radiometers. The LED shadowband radiometer in operation at Geronimo Creek Observatory since 1998 is now part of the TLU site. The site also includes a broadband UV-B radiometer, a photosynthetic radiation detector, a zenith sky detector and various weather instruments. Click here to visit the home page of the USDA UV-B program--and to view and even download data from the TLU site. Replacing a shadowband motor and cleaning the optics. This UV-B radiometer measures UV-B and the ozone layer. Compressed sunset on Easter Sunday, 27 March 2005. SEGUIN – Texas Lutheran University recently became the newest United States Department of Agriculture (USDA) UV-B (ultraviolet -B) monitoring site with the addition of highly sophisticated broadband and shadowband sunlight radiometers atop its Moody Science Building. The USDA UV-B network forms a grid across the continental United States, Alaska, Hawaii and Canada. TLU is now the thirty-first site in the USDA UV-B program and the only site between Big Bend, Louisiana and Oklahoma. Seguin atmospheric researcher Forrest M. Mims III is the site operator for the new USDA instruments. Shadowband radiometers measure light coming directly from the sun and light scattered by dust and haze in the atmosphere. They measure various colors of sunlight, the ozone layer, haze and water vapor. Other instruments at the TLU site measure the UV-B that causes sunburn and blue and red colors of sunlight that make plants grow. Temperature, atmospheric pressure and relative humidity are also measured. Scientists will also be able to track major dust, smoke and other air pollution events as they move across this area from adjacent states, Mexico, Africa and Asia. Dr. John Sieben, dean of Texas Lutheran University’s College of Natural Science and Mathematics, is pleased to have the instruments on campus. "This gives TLU a chance to cooperate in a project that is of value to our country and the world and at the same time will suggest numerous science projects for our students to use in research and senior seminars and for area high school students to use in science fairs," he said. "Our closer association with Mr. Mims that will result from our participation in the UV-B project will bring its own set of rewards for the TLU community." Data from each site are automatically sent to Colorado State University every night and made available on the Web by the next morning where scientists can access the information. Dr. Mark Gustafson, associate professor of biology at TLU, noted that students could also access the data for use in class projects or research projects in environmental science. Data gathered allows the assessment of the potential impacts of increasing ultraviolet radiation levels on agricultural crops and forests. In a broader sense, the monitoring program supports research that increases the understanding of the factors controlling surface UV-B irradiance and provides the data necessary for assessing the impact of UV-B radiation on human health, ecosystems and materials. "The new UV-B site at Texas Lutheran University is among the most important atmospheric monitoring sites in Texas," said Mims. He reported that the instruments were in place just in time to measure the effect on sunlight of smoke from large fires in Southeast Asia that recently passed over south Texas. The USDA UV-B Monitoring and Research Program is part of the USDA's Cooperative State Research, Education and Extension Service (CSREES). The program was initiated in 1992 through a grant to Colorado State University to provide information on the geographical distribution and temporal trends of UV-B radiation in the United States. TLU is an exclusively undergraduate university of the liberal arts, sciences and professional studies located in Seguin, 35 miles east of San Antonio. Founded in 1891, TLU has been recognized repeatedly by US News & World Report magazine as one of America’s best comprehensive colleges and a best value in education. The university also was included in The Princeton Review’s 2003 list of best colleges in the western United States. Copyright 2004 by Texas Lutheran University.